Over the weekend, a Reddit post certainly grabbed our attention, considering we're on a "Tell Us About Your Bad Neighbors" kick over here at PhillyVoice. Just take a look at the cleaned-up title of Redwoodser's post: "Racist piece of s*** steals recycling container and then tries to attack me for telling him to put it the f*** back. Full story inside." Why, no, that doesn't sound like a healthy neighborly relationship, no siree. Redwoodser pulls no punches in describing the situation that led him to put the "ungrateful simpleton cousin of my next door neighbor, who is also an ungrateful alcoholic simpleton" both on blast, albeit anonymously. It's anonymous insofar as no names are referenced. It's not so much anonymous as Redwoodser attached a video clip showing him threatening the alleged recycling container-thieving neighbor's cousin with a baseball bat. This happened last Tuesday. J_____ the ungrateful alcoholic simpleton cousin of my next door neighbor, who is also an ungrateful alcoholic simpleton, and someone that I've had problems with before, because he's a r******* piece of s*** that doesn't listen, among other things, accidentally and stupidly stole the recycling container that I had given to my neighbor from China, after I had moved it from the curbside after collection and placed it by his house 5 minutes earlier. I somewhat loudly but nicely told the imbecile twice who the container belonged to, and told him that the container in his hand did not belong to him and that his cousins container was in the street sitting in front of his truck, to which I pointed, and he still refused to listen to me and refused to put the container back. After he entered the house next door with the container and before he shut the wooden door, because the glass storm door had shut, I approached him and told him that the container had the house number of the owner on it and that it did not f****** match up with the house that he just entered, and I called him a r******* f****** b**** because he's a r******* f****** b**** that doesn't f****** listen. He looked at the numbers on the side of the recycling container and twitched his head, then he exited the house and threw it on the porch and followed me into my house and threw a punch, from which I leaned back and away from. I immediately picked up a bat standing next to my front door and he saw that and ran for his life. Moral of the story: Bats are good. Sheeeeeeeet. These are clearly the words of an angry man, and one who drew nearly 300 Reddit comments within a day of going public with his story. Though the online exchange, we learn that Redwoodser lives near Temple University. Some commenters took offense to his choice of language or willingness to throw over the recycling bin that he procured – via bicycle ride to Southwest Philadelphia – for the "very nice Chinese guy (who) bought the house of my enemies that had screamed at me and tormented me and threatened me with violence for over a year." While one celebrated his actions as "the most Philly thing I've ever read," another was willing to "bet every neighbor on that street absolutely hates (the hipster transplant)." Also, the sight of a white man chasing a black man with a baseball bat isn't all that pleasant from a race-relations standpoint. We sent a couple private messages to Redwoodser in the hope he'd explain the situation further, particularly since he makes weighty accusations about the neighbor's cousin - and there's no audio in the video. We did not hear back as of Monday morning, but will update this story should that change. From afar, it seems as if there are substantially better ways to handle a confrontation of this nature on both sides, but not hearing the other guy's side of the story leaves us at a loss for zeroing in on a definitive stance. But, whatever. 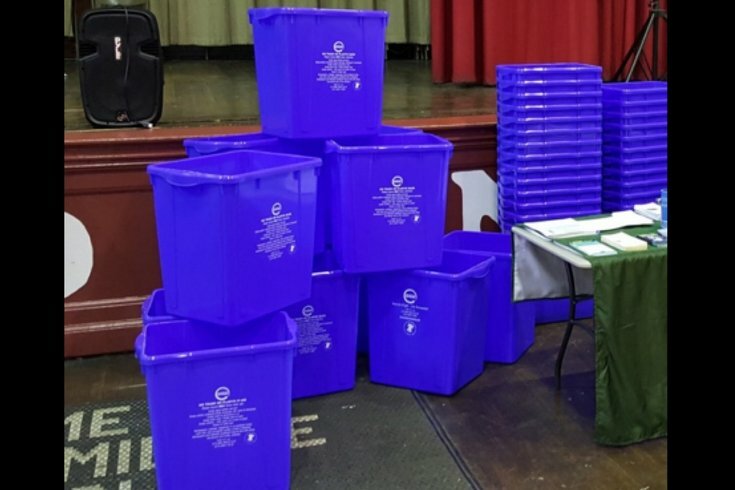 What do you think: Did Redwoodser overreact or are recycling containers a hill worth potentially dying on?